Deeping Rangers are denied in this attack against Harborough. Photo: Tim Wilson. It’s six of the best for Yaxley FC. The Cuckoos are up to fifth in the United Counties Premier Division after beating lowly Boston Town 6-1 at In2itive Park yesterday (October 8). That was a sixth win in succession for Brett Whaley’s men. Deeping Rangers celebrate a goal against Harborough. Photo: Tim Wilson. Charlie Sanders scored twice with Dan Cotton, Phil Stebbing Rob Hughes and Joe Butterworth also on target. Cotton’s strike was a top quality effort into the top corner, while Butterworth was scoring for the second successive game following his move from Whittlesey Athletic. Boston finished the match with nine men following two red cards. Deeping Rangers are also on fire currently. They made it five wins in a row with a mightily impressive 5-0 win over a Harborough Town team who went into the game on a nine-match unbeaten run. It was the best performance for over 12 months by Deeping according to manager Michael Goode. Scott Coupland (2), Henry Dunn (from 30 yards), former Posh player Charlie Coulson and Will Bird scored the Deeping goals. A long-range shot from Deeping Rangers against Harborough. Photo: Tim Wilson. Deeping, who are 10th, are the only team to have beaten Peterborough Sports in the Premier Division this season. That match took place on September 6 and since then the city side have won eight matches in a row in all competitions. The latest arrived yesterday when a hat-trick from Avelino Vieira secured a 3-0 win at ON Chenecks, not a lucky venue for Sports in recent seasons. 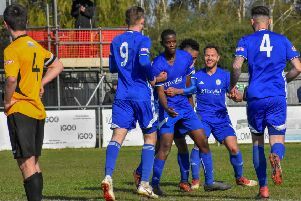 Sports remain three points clear of second-placed Eynesbury and they almost received a huge favour from city rivals Peterborough Northern Star who led third-placed Desborough 1-0 as the game entered the 90th minute. Unfortunately Desborough scored twice late on to make Levi Wright’s first-half goal for Star irrelevant. Levi Wright opens the scoring for Peterborough Northern Star at Desborough. Photo: Tim Gates. Michael Frew scored twice in the opening half an hour as Wisbech Town beat Harrowby 2-0 at Fenland Park, while Holbeach bounced back from two straight defeats to win 3-2 at Leicester Nirvana. Tigers benefitted from a first minute own goal and sealed victory with strikes from Jack Smith and Tommy Treacher. Bourne and Blackstones remained in the bottom five of Division One after disappointing defeats at Melton and Bugbrooke St Michaels respectively. Steve Mastin scored both Blackstones’ goals in a 4-2 reverse at Bugbrooke St Michaels. March were duffed 5-0 at Braintree and saw David Jackson dismissed in Division One of the Thurlow Nunn Eastern Counties League. There were contrasting fortunes for Stamford and Spalding in the opening round of the FA Trophy. The Daniels pipped Basford with a debut goal from Grant Ryan in a game that was delayed for an hour to treat an injured visiting player, while the Tulips, unbeaten and top of Evo Stik Division One South, were thumped 4-1 at Gresley. The injured Basford player suffered a double leg-break and was detained in hospital overnight. Northampton ON Chenecks 0, Peterborough Sports 3 (Vieira 3). Bugbrooke St Michaels 4, Blackstones 2 (Mastin 2). Braintree Town Res 5, March Town United 0.